Bopper Stopper cover helps protect everything from electrical outlets to push buttons to volume and lighting controls. 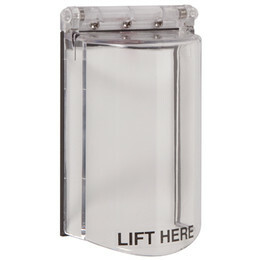 Inexpensive and highly durable, this hinged cover lives up to its name for a wide range of applications. Can take hard knocks in stride while protecting digital keypads, electrical outlets, smaller size pull stations and push buttons to name just a few. 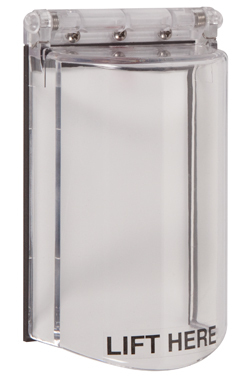 Both the cover and hinge is molded of polycarbonate material while the hinge springs are formed from stainless steel. Comes complete with installation screws and gasket. Bopper Stopper is backed by a three year guarantee against breakage in normal use. Cost effective and easy to install. Gasket replacement recommended after five years.